IDF ends controversial program to integrate women into Armored combat units, says program too expensive right now. Women will not be assigned to combat units in the Armored Corps, the IDF announced Sunday. In addition, female soldiers who have been trained to operate tanks will be placed in other combat units such as the Caracal Infantry Battalion. The decision was made in the context of the decision of former chief of staff Lt.-Gen. Gadi Eisenkot to carry out a pilot program to integrate women in combat roles in the Armored Corps. 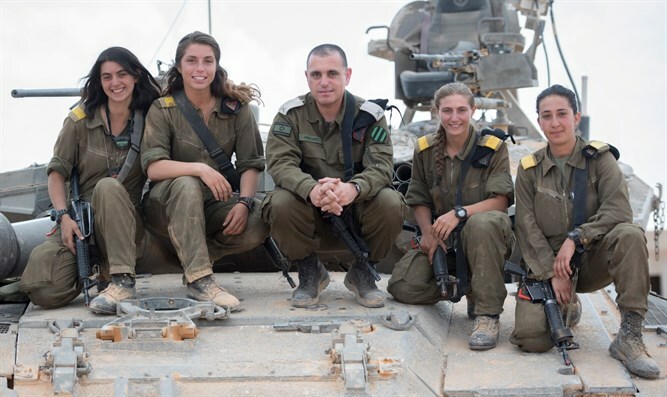 During the program, which was defined by the IDF as successful, 10 of the 15 female soldiers who began the course completed their training and became combat soldiers in the Armored Corps, four of whom became tank commanders. The IDF Spokesperson's Office said, "During the course of a year and four months, an experiment was conducted to examine whether a team of women could operate a tank in an operational manner suited to the challenge of border defense. During the course of the training, three tank crews and four UAVs were successfully trained." "The assessment of the situation in the Ground Forces with the Armored Corps revealed that the next stage in the experiment requires a significant increase in manpower and infrastructure for the realization of the process. In light of this, it was decided that at this time it is appropriate to strengthen the integration of combat units in existing units, and not to establish new combat units. The knowledge to implement the process, if it is decided in the future, has been acquired and exists," the IDF added.